This post was written with the expertise of B A Madden, a company that provides a Painter and Decorator Service in London. 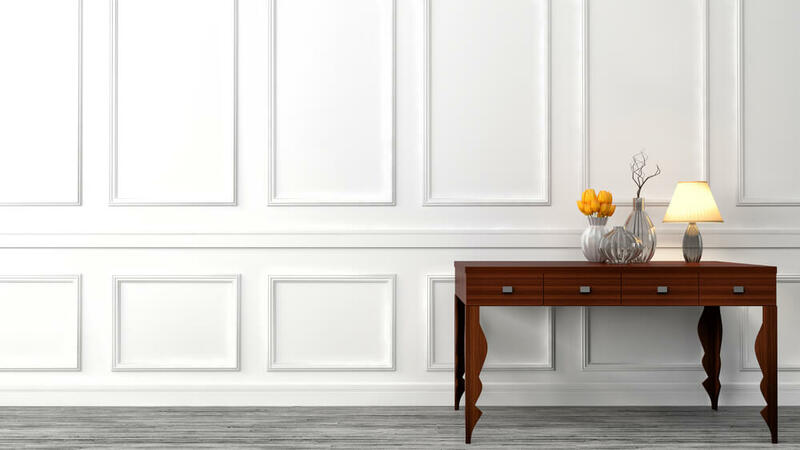 According to Living Spaces, “A console table is wide, fairly shallow and roughly as tall as a regular table or desk.” These tables are typically made of wood. You might have seen a console table behind a sofa in a living room. Console tables are typically 30 inches tall. The height can vary slightly depending on the manufacturer. Most people put console tables behind their couches, so the height is important. Make sure you measure the back of your couch. Find out the height of any console tables you might buy. You can find console tables nearly anywhere. If you want a good deal, check yard sales and thrift stores. Most home furnishing stores will have plenty of options as well. Be sure to take measurements of your couch’s height before you go shopping. What Can You Do with a Console Table? Console tables are both a functional and a decorative piece. Most console tables have drawers and shelves. This is great for storage purposes. Since console tables are shallow, they don’t take up a lot of space. You will still have plenty of space for other items and furniture. Console tables are a great decorative piece on their own, but they look best with more on them. They are a good way to display your favorite pieces. They are also very functional. You can display decorations or useful items on them. Most importantly, you don’t want to leave them completely empty. The decorations that you choose to place on a console table can tie a room together. You may not have another place to display those specific items. There are several different places you can use a console table. Most commonly, they are used in living rooms. You have probably seen console tables behind couches. You can also put them against any bare wall. Anywhere that you can still access the items on the table works well. It's a good idea to add at least one lamp. You can place a lamp on one side or place one on each side. Then, you should add a larger piece as an accent. This may go on top of the console table or on the wall above it. It’s important to use a variety of pieces of different heights. This adds interest and prevents the space from looking too boring. If you have a few small decorative pieces, add a taller piece for contrast. If you have stacks of boxes or books, use them to display other items. They can work as a pedestal. You should focus on balance rather than symmetry. If you have shelving on your console table, add an accent piece on each shelf. Then, add the rest of the pieces around those larger accents. Create small groupings and allow pieces to overlap. According to Ballard Designs, you should stick to three or four colors in your living room. This will help to keep the space cohesive. You will know exactly what to look for when looking for pieces to add. Select three or four colors that are in your living room. Use those with your console table too. Where Else Can You Use Console Tables? If you decide you don’t want to use a console table in your living room anymore, there are other places to put it. Console tables look good in entryways. They can be placed in a home office too. Due to their narrow size, you can sometimes fit them in a hallway. Console tables are very versatile. Console tables provide storage with shelving or drawers. This adds functionality wherever you choose to put the console table. You can use a console table as a TV stand in your living room. You can then use the storage for DVDs and any cable boxes. Using a console table as a vanity works too. Again, the storage comes in handy. You can store extra products in baskets on the shelves. Now that you know how to decorate the console table, you can change it as needed. Be sure to follow these guidelines. Don’t let the shallow depth of a console table intimidate you. These tips will help you make the project a success. Feel free to add your own style to make it work with the rest of your space as well.